As landlords and property managers, we are faced with a whole host of issues with which to deal. Some of them cannot be eliminated because the life expectancy and normal wear and tear of items in a house are finite and therefore repair and replacement of items are necessary. Thankfully, landlords and property managers do have influence and control over finding the right person to rent their properties. Afterall, bad tenants can cause more problems and headaches than any worn out appliance could ever create. The way to eliminate problem tenants is through the use of a good tenant screening process. It’s not only important to have a specific screening process so that you don’t miss an important step, but also to ensure that you are consistently following the same criteria and treating all prospective tenants equally. A violation of The Fair Housing Act can spell legal trouble which is never good news. In addition, if you are making exceptions for people who don’t pass your screening criteria, they will likely fall short of your expectations of paying on time and taking good care of the property. The screening process should start at the first point of contact, this generally occurs via an email or phone call from the prospect with an expressed interest in your rental property. This first call is a good time to ask some questions to get a general sense of the applicant’s eligibility. Do this before you waste time showing the property and the requiring that the prospect pays an application fee. Nothing gained and nothing lost at this point and it’s a great way to determine if the prospect is going to be a good tenant. If you are contacted by phone make sure to jot down notes on the prospects answers to your questions. 1. Why Are You Seeking A New Place To Reside? While this question is a bit awkward because it seemingly shouldn’t matter it may reveal some information that could matter A LOT! For instance, if the tenant is moving because of an eviction, this is a big red flag! If the tenant received a no cause vacancy, or simply identifies complaints about a past landlord, notice this could indicate that the landlord was not happy with the tenant. If the prospect is moving because of issues with their current landlord, you should pay attention to these issues as they could carry forward into your tenant/landlord relationship. If the prospect is moving to the areas because they landed a good job this is a good sign. They are employed and employed at a place that is worth moving for. Another very real and legitimate reason to move is that they need more space for a new addition to the family. There are a whole host of reasons that people move that are perfectly fine but it does pay to ask this question and listen carefully to the response. 2. What Is the Household Monthly Income? 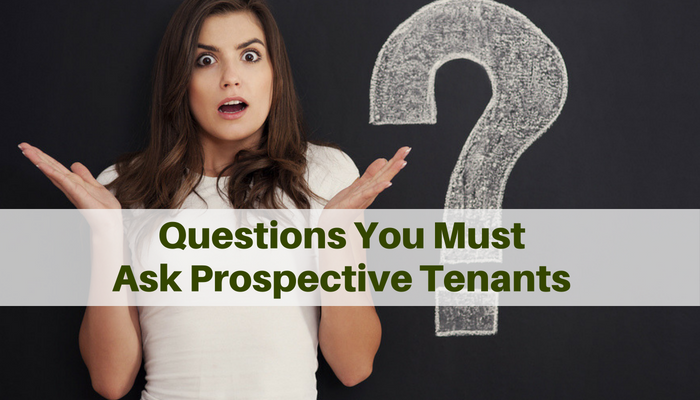 This question is very important and you would not believe how many times I’ve gotten inquiries from people who simply cannot afford to rent the property. In general, monthly income needs to be at 3 times the rent payment. The rental application and credit report will sort this out in more details but having a minimum monthly income allowed will weed out a lot of unqualified prospects. Obviously, if any prospective tenants have a large debt load the income to debt ratio needs to be sufficient to cover the monthly rent payment. 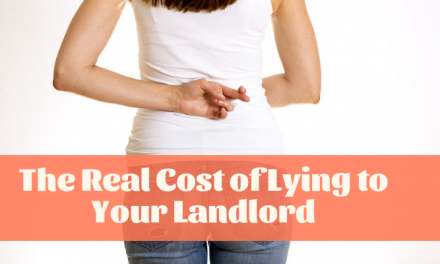 Letting the tenant know that the first and last months rent plus security deposit is due at lease signing is also a way to weed out those who would struggle to come up with the monthly rent payment. Those who live paycheck to paycheck don’t have a buffer to cover unexpected costs and rent payments often are of a lesser priority than a cell phone, car payments, etc. 3. Do You Consent To A Credit and Criminal Background Check? This simple yes or no question is the question that I’ve really learned a lot about a person’s past. Obviously, if the prospect says “no, I won’t consent” then they should be automatically disqualified. I’ve gotten a lot of stories and excuses as to why their records are in the state they are and sometimes there are seemingly legitimate reasons but I absolutely will not waiver from my tenant screening criteria. I’ve found in the past that making exceptions is bad business and can be a costly decision. Plus, as I mentioned earlier treating all prospects and tenants equally is the law to prevent discrimination. 4. Will You Provide Contact Information For Your Current And Previous Landlord And Employer? If a prospective tenant refuses to provide references it is a clear sign that you would unearth something that reflects poorly on the individuals wanting to occupy your rental home. The reason I include previous landlord, as well as current, is because if the current landlord is trying to get rid of the troublesome tenant they may be inclined to provide a positive reference in order to get the bad tenant to move along. Getting information on a prospects habits and character will give you a good idea if they will be good tenants. Asking obvious but nonetheless important questions such as; ‘Why did they move out? Did they pay rent on time? Did they leave the property in good condition?, Were there any conflicts with the neighbors?, Were there any issues with illegal activities?’. 5. How Many People and Pets Will Be Residing With You At The Home? The more people living at your property the more wear and tear you can expect. Some things to ameliorate this could be to set a limit on the number of people you allow or require more for the security deposit. Just ensure that you are protecting yourself from a sticky legal situation by checking your state and local occupancy laws before implementing a rule, and remember that familial status is protected; you cannot ask if the prospect has children. These rules must be based on occupancy numbers only, and not on the ages of those who would live in the home. It’s also a good time to inform the prospect that everyone over the age of 18 is required to pay the application fee and consent to a credit and criminal background check. Obviously, if you have a no pet policy or restrictions on the type or size of pets and the prospect doesn’t meet that criteria then there is no need to waste either of your time showing the property. Asking these five questions only takes a few minutes and should give you enough information to know if you want to proceed with a more formal and time-consuming screening process. Do You Know Your State’s Laws on HVAC System Repairs? As a manager at a mobile home court, but currently looking for work, I tell potential residents our rules up front. I do not ask said person if they mind a background Nd credit check I state it is part of the process of becoming a resident. Usually, I am asked what we are looking for. I explain the process and in most cases the person eliminates themselves before we even get to the application part. I believe being upfront eliminates a lot of wasted time. Good point Bart, transparency in your screening process give tenants the option to decide if they want to go through the application process and pay the fee if they understand they wont qualify.